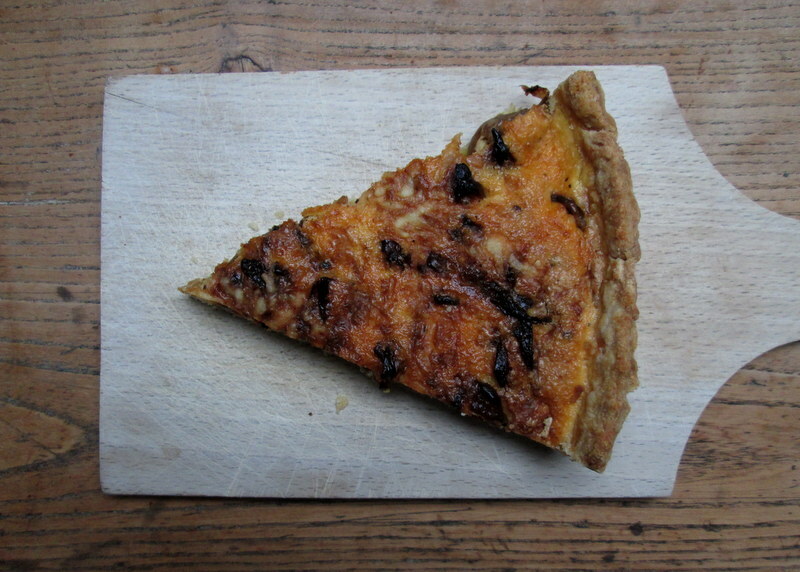 OK, so I do occasionally make things other than Christmas cookies, and last night I made this caramelised onion quiche. I loooooove pastry. 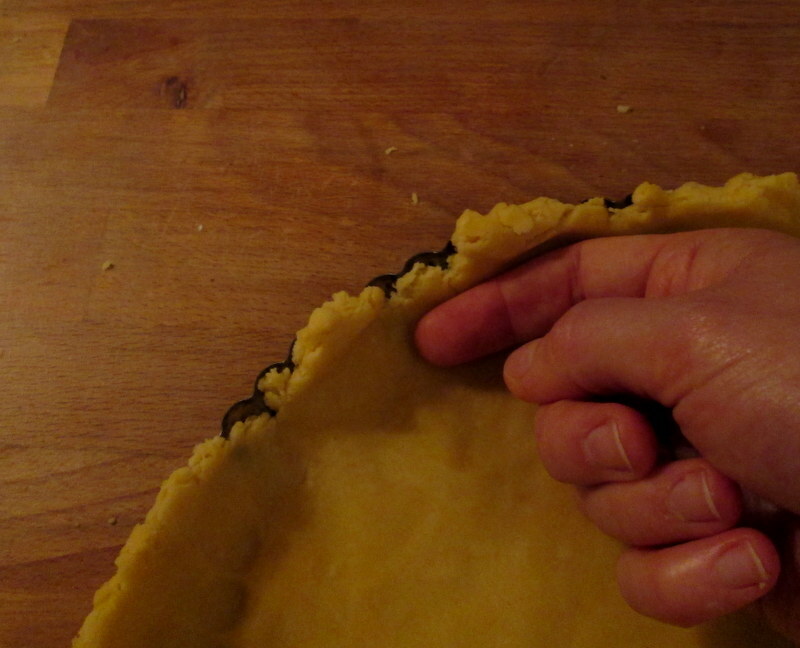 To me, there is almost nothing better than flakey, home-made-with-butter, pastry. Especially when paired with caramelised onions. 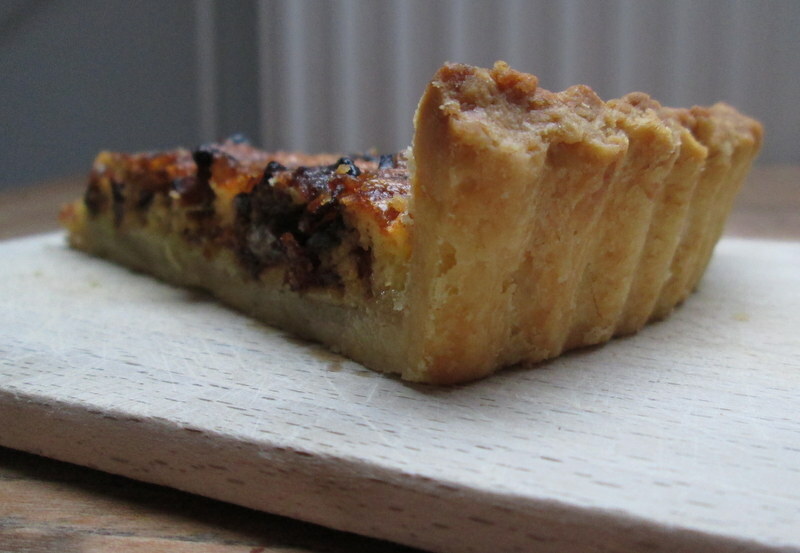 I mean… (deeply satisfied butter-pastry-and-caramelised-onion sigh). I always decide to make this sort of last minute, when I get a big enough craving for it, and it usually results in a sort of late dinner, depending on what time I make it home from work. But it’s always worth the wait (I’m exaggerating here, it really doesn’t take that long to make, but I am very much a fan of the ‘ready in 30-minutes’ dinner during the week, and that, this is not. 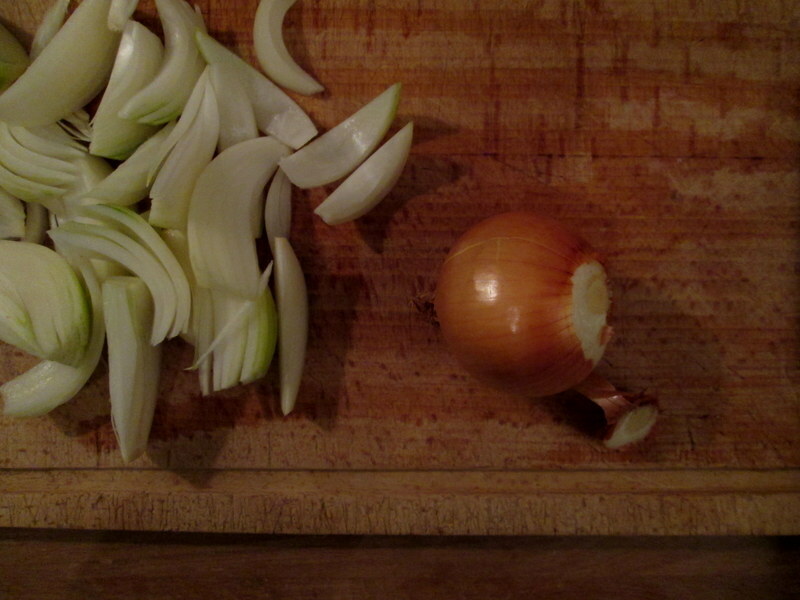 But oh, the onions. 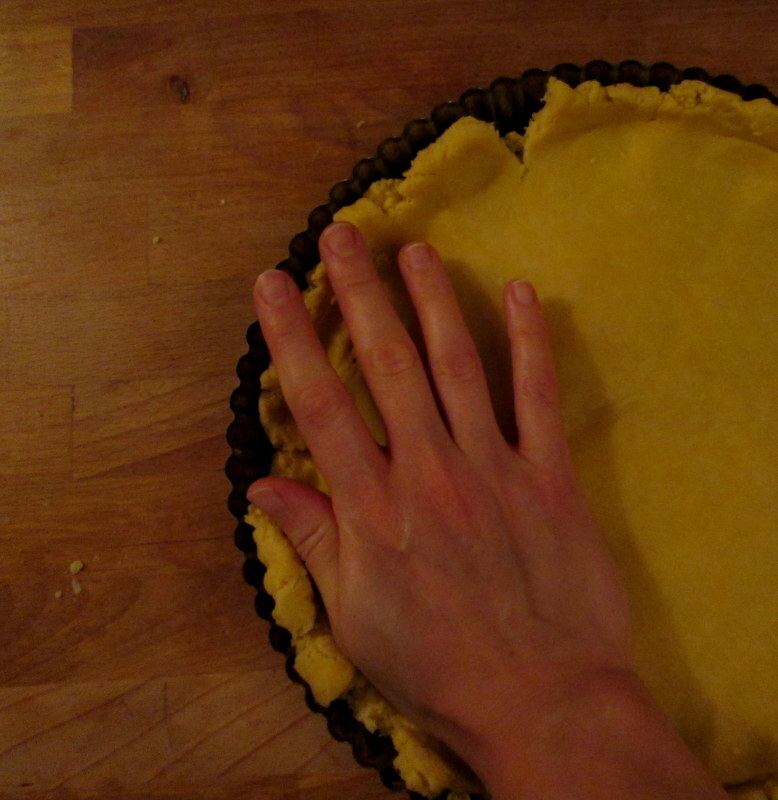 And the flakey pastry. My recipe is a mix of this one, and another one for Quiche Lorraine from one of my mum’s old Danish cook books that she inherited from her mum (I very much doubt it’s still in print, it’s this awesome compilation of baking recipes from the 1960’s, small but very comprehensive, with drawn illustrations of cakes and such). 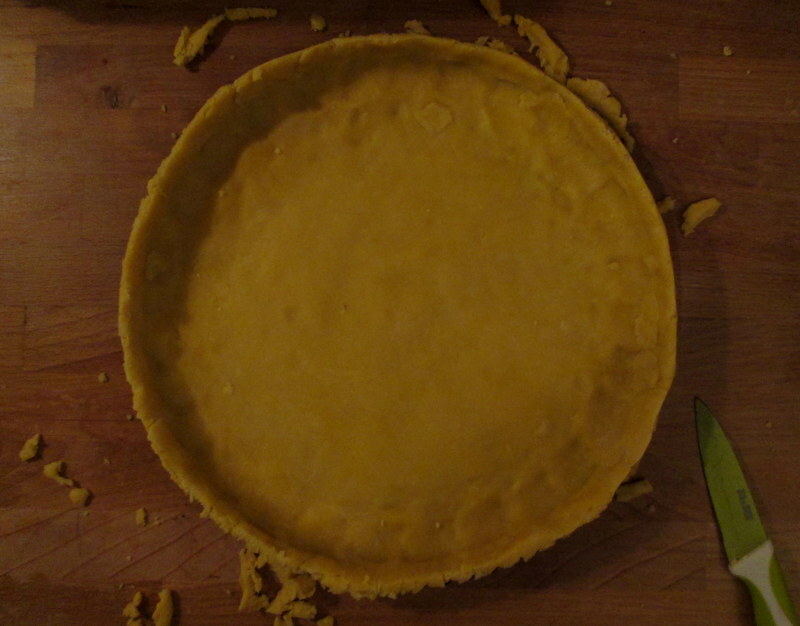 If you’d rather, you can always buy ready-made pastry instead of making it yourself, but do try to get one made with butter, and not the kind with vegetable fats/margarine – if nothing else then for the flavour. 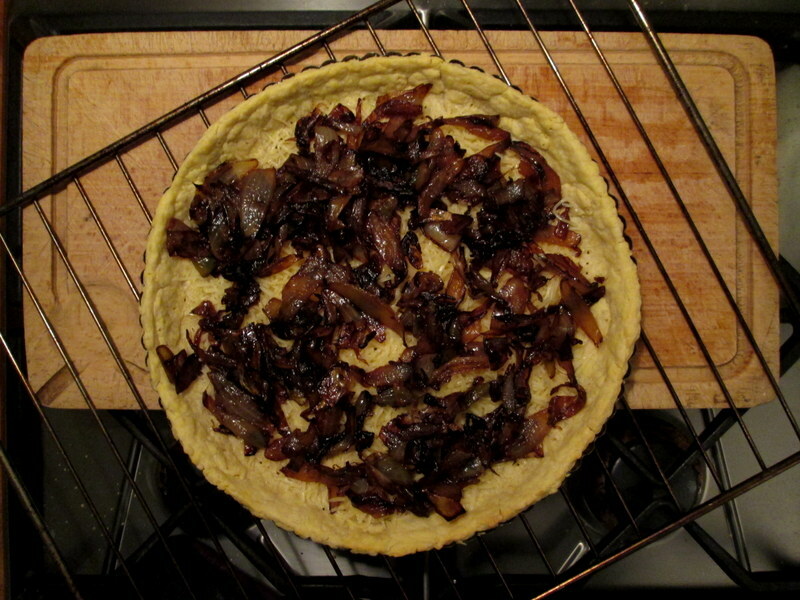 But the onions take about an hour to caramelise, so if you’re feeling industrious, why not make your own pastry in the meantime! 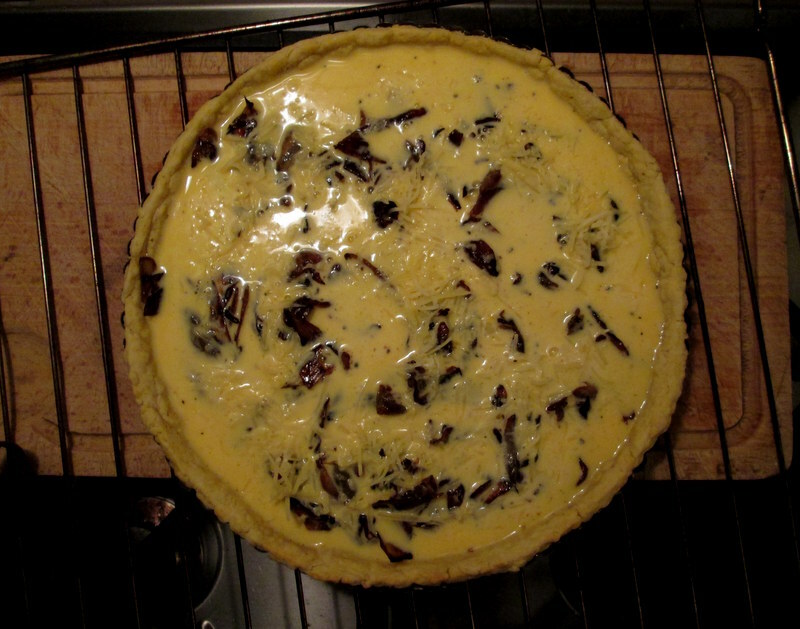 And this one is super quick and easy to make 🙂 What discourages me from making quiche more often is the rolling out the dough part – I just can’t always be bothered to roll out dough, somehow that just seems unbelievably exhausting to me sometimes. 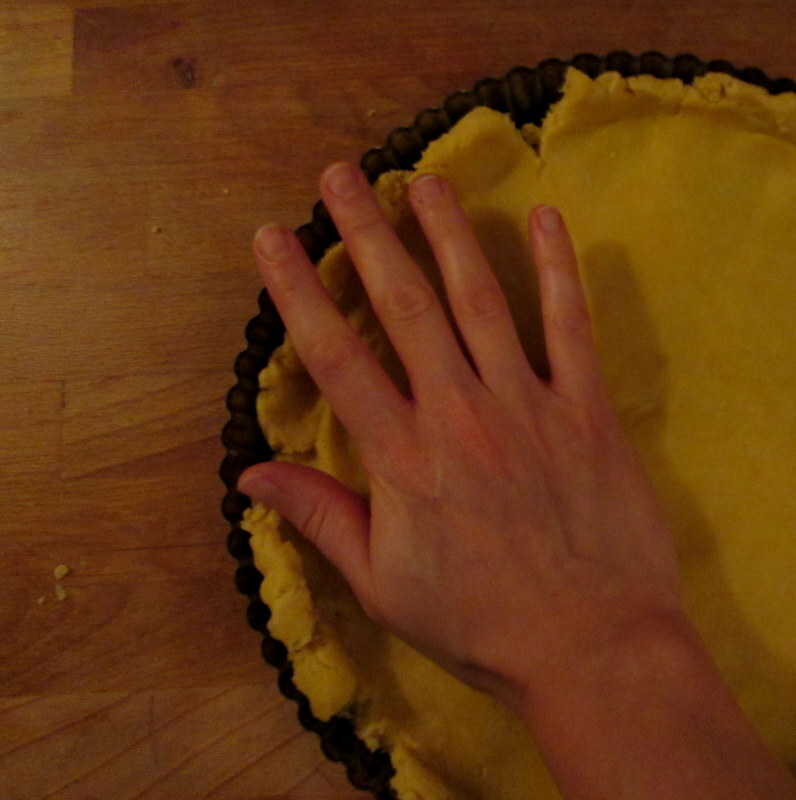 But for a while now I’ve been pressing the dough into the pie dish instead of rolling it out, and while it probably takes the same amount of time, I feel like it’s just a whole lot easier, no flouring the counter top, no faffing about with the rolling pin. Win-win. This is not a quick dinner, but doesn’t take hours and hours to prepare either (about 1 1/2-2 hours total, including baking) and it’s easy, cheap, and very filling and delicious! 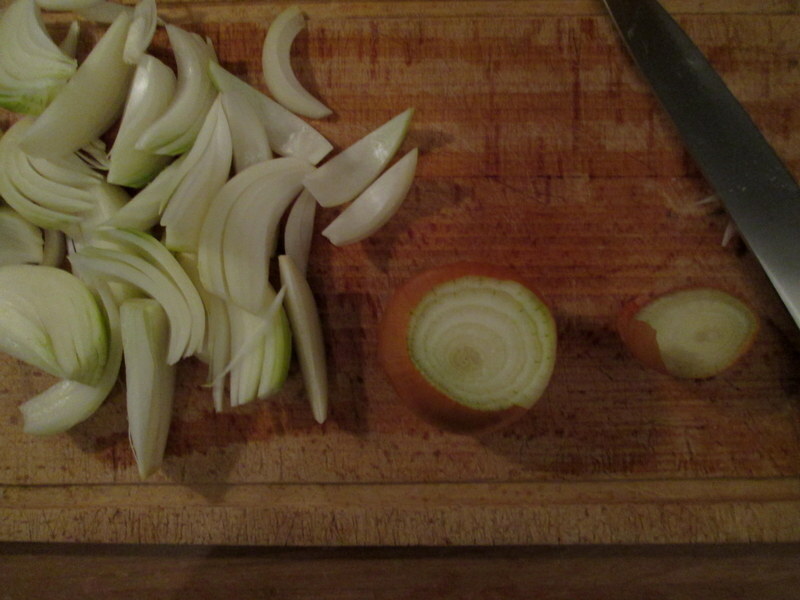 Begin by slicing your onions. 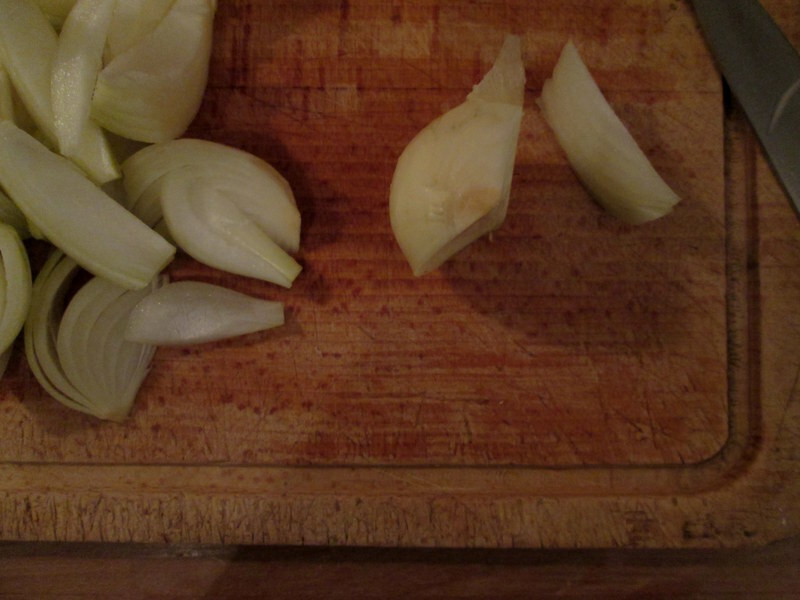 Make a shallow cut at the root end, just to remove the root bit but so that the onion still stays intact, then make a slightly less shallow cut at the other end of your onion, and remove the papery bit. 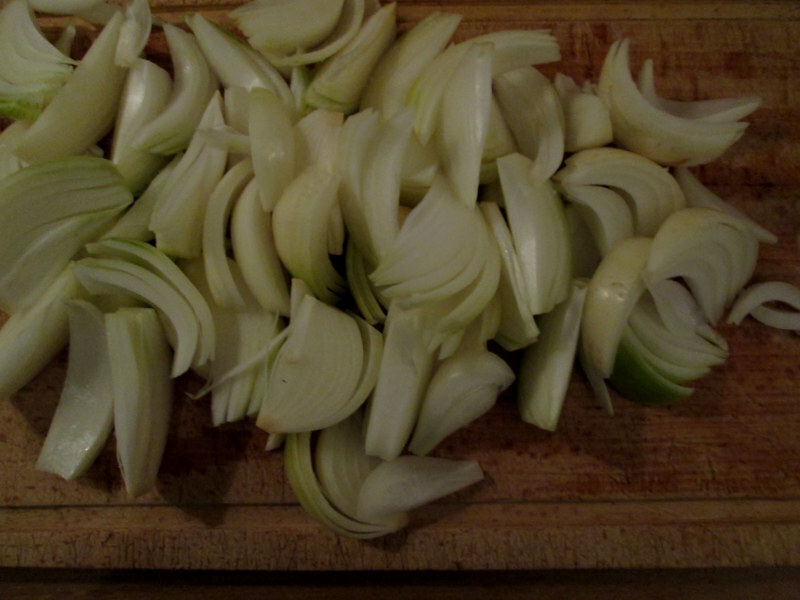 Place your onion root-end up on your cutting board. 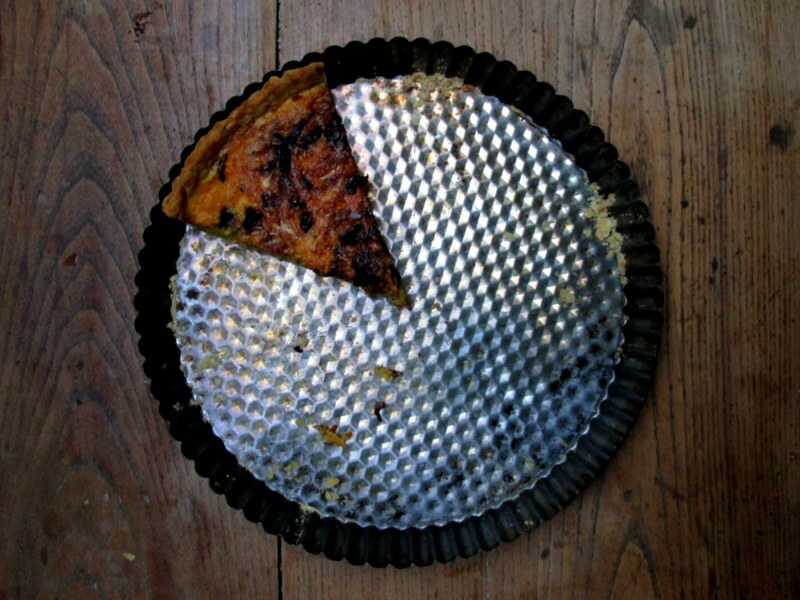 Cut it in half, then cut each half into about six-eight thinner slices, so that each slice stays (more or less!) intact/attached at the root end. Do this with all your onions. Heat up the oil in a heavy-bottomed sauté pan, and add your onions and a good sprinkle of sea salt. Cook the onions on medium to high heat for about ten minutes, stirring occasionally, to give the onions a nice colour, then turn down the heat and leave them to simmer for about 30 more minutes, stirring now and then. You don’t want the onions to burn, but if they get a little charred here and there that’s perfect! When the onions are nice and soft, and quite brown, add the balsamic vinegar and cook for a final 5-10 minutes on low heat, stirring a good few times to prevent burning. Take the onions off the heat. 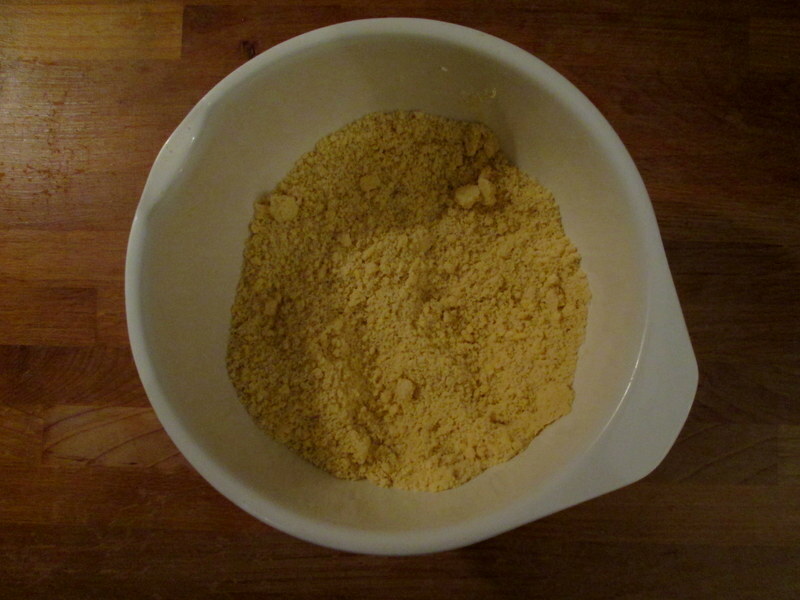 Rub the butter into the flour till it resembles breadcrumbs; add the salt, giving it a mix with your fingers. 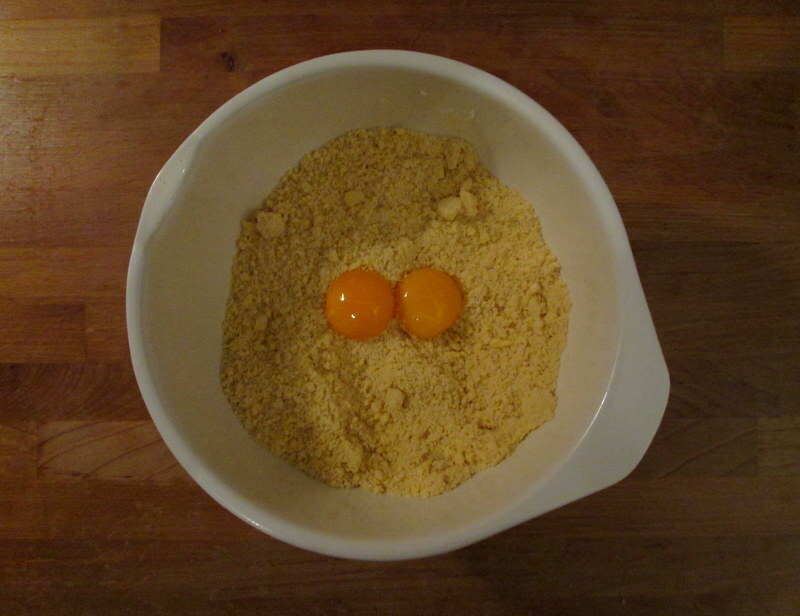 Then add the egg yolks and 3 tbsp of water. 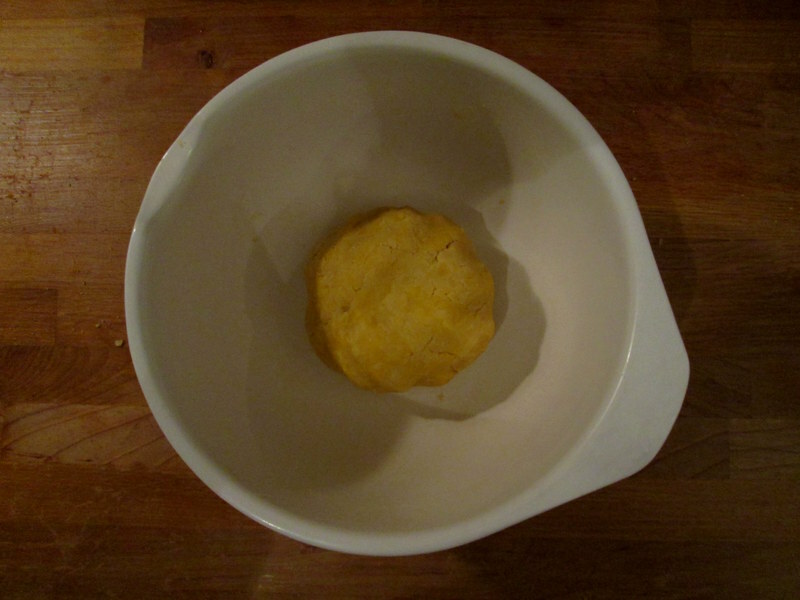 Mix with a fork to distribute the egg yolks and water throughout the mixture, then gently press the dough together with your hands (if the dough is too dry to stick together, add a tiny bit more cold water, 1/2-1 tbsp). 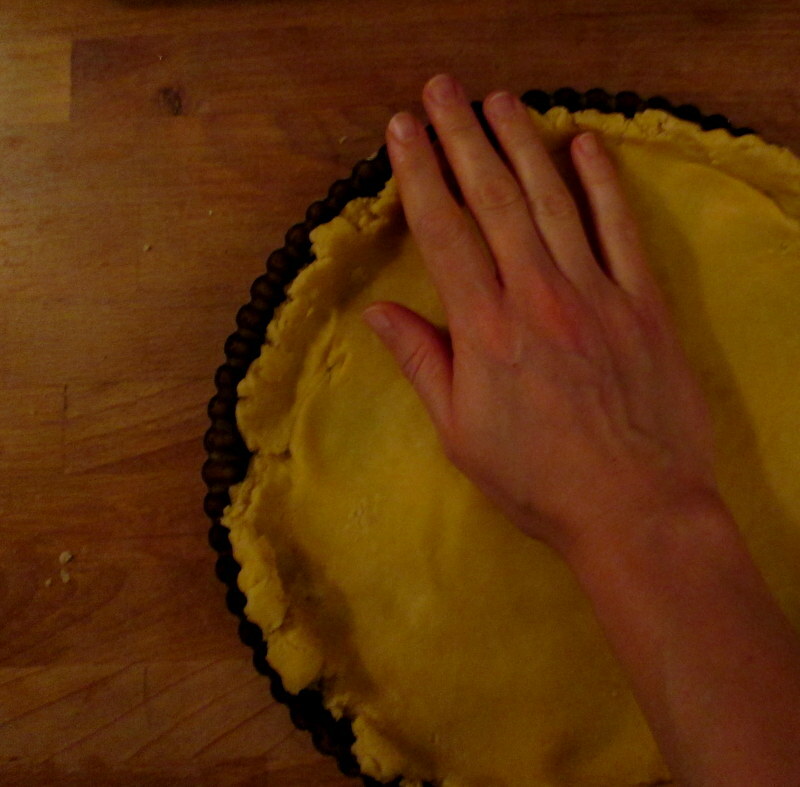 Press into a round disc, place the disc in your pie dish (no need to grease the pie dish). 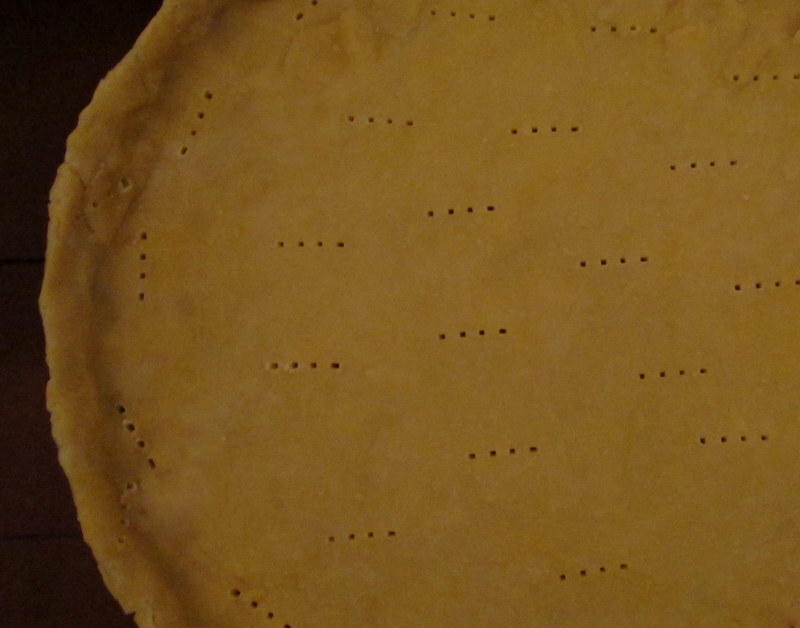 Using he ball of your hand, press the dough into your pie dish, pressing from the centre outwards to the edge of the dish, and turning the dish clockwise to repeat and cover the whole pie dish. 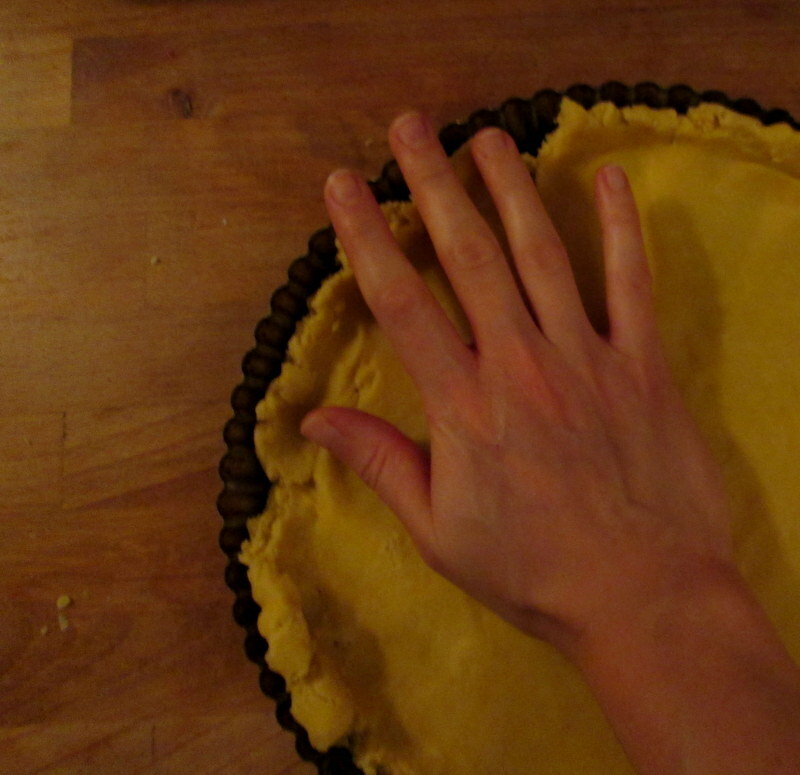 Use your finger to press the dough up the sides of the pie dish, until you have a bit of overhang. Cut most of the overhang off but leave a little bit, about 5 mm, and use any extra dough to fill any gaps or thin patches. Leave to cool in the fridge for about 30 minutes before blind-baking. When the onions are about half way done (or whenever you want to blind-bake your tart shell), preheat your oven to 200°C/400°F. 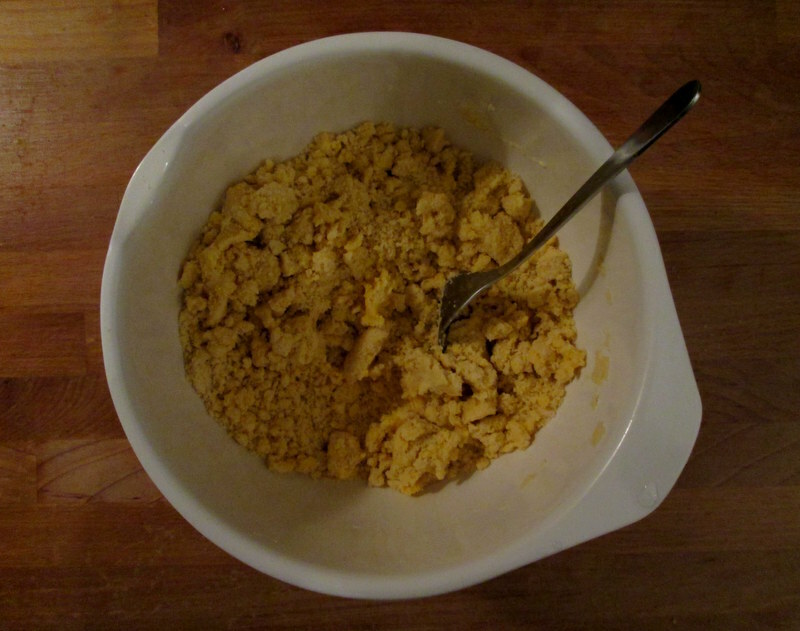 Mix the eggs, cream, pepper and nutmeg in a medium bowl. 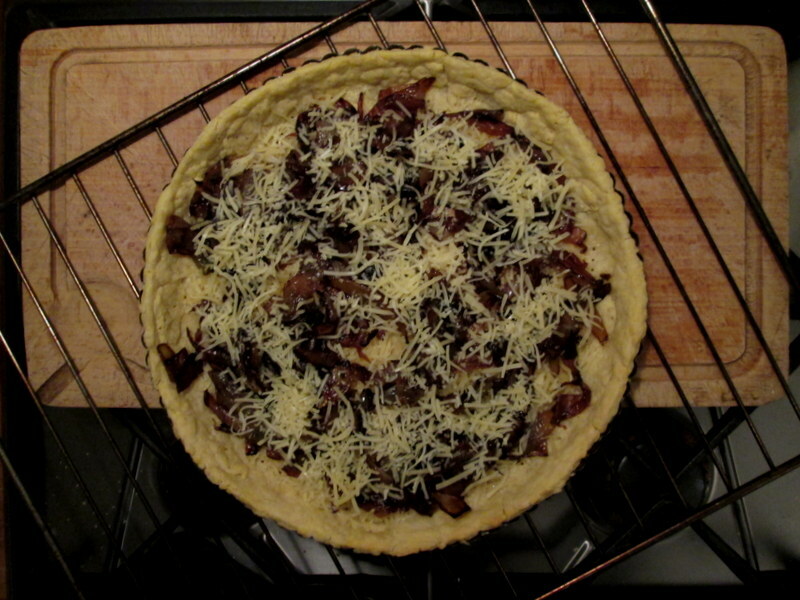 Sprinkle half of the cheese on the blind baked pastry, distribute the caramelised onions on top, followed by the rest of the cheese. Pour over your egg-and-cream mixture, then bake for 20-25 minutes at 200°C/400°F until the pastry is golden brown and the filling no longer wobbles. Take out of the oven and leave to cool slightly for 5-10 minutes before eating! 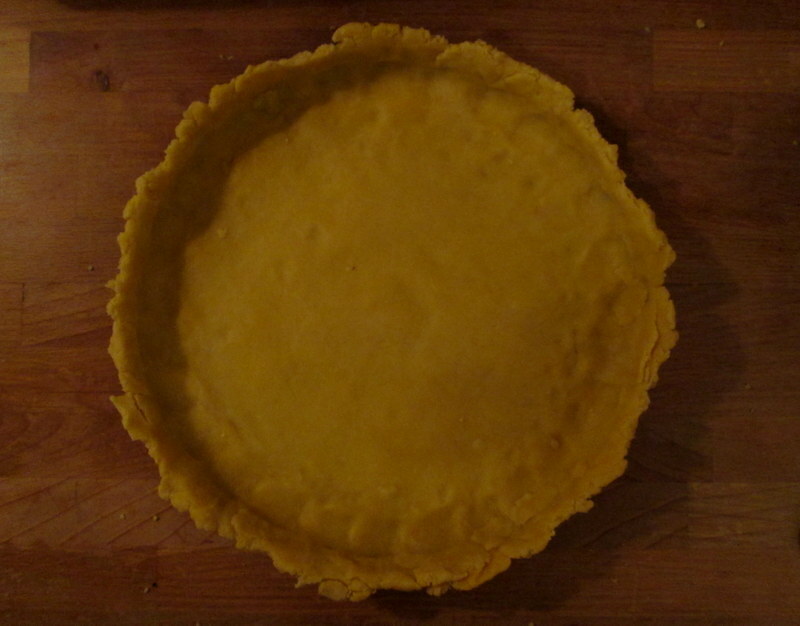 The filling will have puffed up a little like a dome, but it will fall back down once it’s out of the oven and has cooled a bit. Keeps for 2-3 days in the fridge. 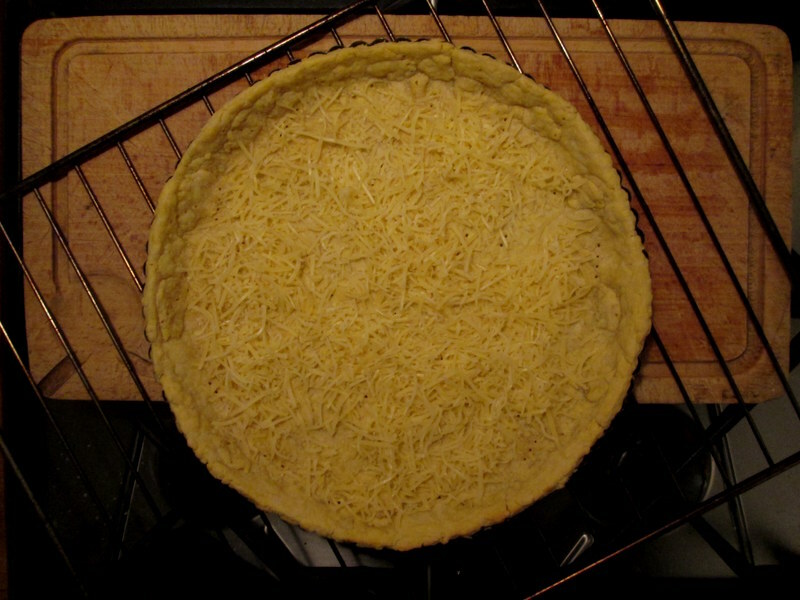 Reheat in the oven or microwave (the oven will ensure a crispy bottom, but it’s equally delicious albeit less crispy, pastry-wise, if reheated in the microwave).